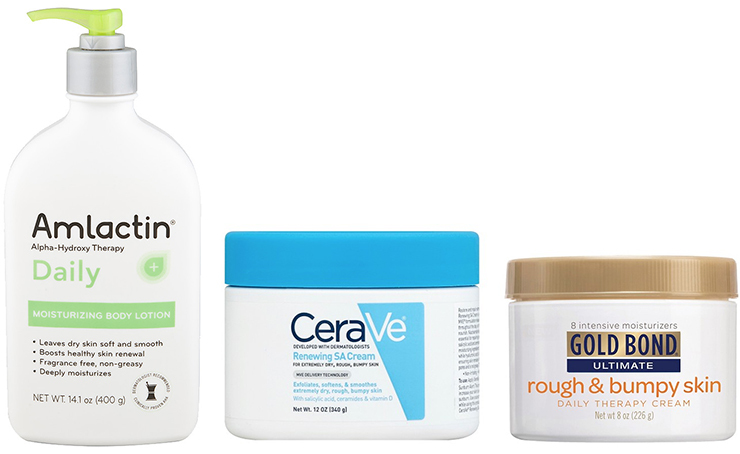 Jump-start spring with remedies for parched, slack, confused New York City winter skin. Nor’easters hurling icy snow…35 degrees one day…70 the next: The East Coast winter of our skincare discontent is nearly over, leaving us with dull, sluggish, flaky, dried-out, itchy, muddled skin. So I contacted Laurel Naversen Geraghty, M.D., a dermatologist who is intimate with New York City weather. She spent 10 years here—first as a beauty writer and Glamour editor, then attending the NYU School of Medicine. When you live that long in this city, she proposes, “you always consider yourself a New Yorker, right?” Dr. Geraghty has since moved back to her home state, Oregon, and joined her father’s dermatology practice in Medford. But she remains keenly aware of the New York climate at its most bitter, and of cosmetics aesthetics. Below, she offers her suggestions and insights for a variety of eminently affordable products that will help take the torpor out of our skin as it heads into spring. 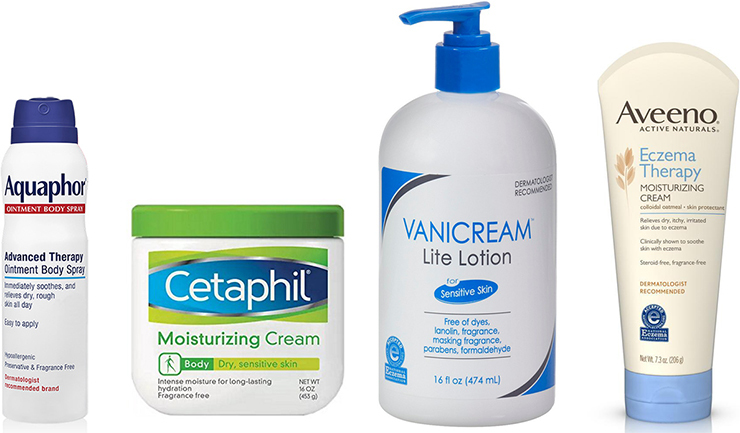 Cetaphil-Moisturizing-Cream, 16 oz., $10.99 at Target. Vanicream Skin Cream with Pump Dispenser, 16 oz. Lite lotion: $9.59, Regular lotion: $13.43 on Amazon. Or Target. Aveeno Eczema Therapy Moisturizing Cream, 7.3 oz., $11.69 at Target. This one contains soothing colloidal oatmeal, known to seal in moisture. AmLactin Moisturizing Alpha-Hydroxy Therapy Moisturizing Body Lotion, 14.1 oz., $12.19 on Amazon. Or coupons are available on the AmLactin website. CeraVe Moisturizing SA Cream for Rough & Bumpy Skin, 12 oz., $17.89 at Target. Gold Bond Ultimate Rough and Bumpy Skin Daily Therapy Cream, 8 oz., $9.49 at Target. Here, I’ve found a handful of new-generation home-use anti-aging products that seriously rev up the complexion. They’re mostly from upstart indie cosmetics companies you might not have heard of. Millennials have been quick to glom onto these rejuvenation brands and treatments for preventive care. But the fact is…their benefits are even better suited to us, their elders. As Dr. Geraghty points out, none of these cosmetics are essential for skin health and radiance the way sunscreen is, and none will do what prescription retinoids or Botox do for minimizing wrinkles. But used consistently, they’re formulated so well that they have a good shot at plumping up and brightening the skin, at least into the next day. Use them regularly and the benefits continue. Consider the rundown that follows as an introduction, with Dr. Geraghty’s comments on the products or their ingredients. And definitely try other offerings from the same brands. Cure Natural Aqua Gel, $38. at Cure Aqua Gel. There’s a novel exfoliation technique that originated in Japan and is rapidly winning aficionados in the U.S. Known as a gel peel (or peeling gel), it involves a syrupy, slippery substance whose key ingredients—acrylates (inert chemical compounds used in plastics and resins) or cellulose (from plant cells)—function as gentler alternatives to scrubbing grains. These gels typically also contain botanicals intended to boost the peeling process and soothe the skin. How to apply? Dab a small amount onto a freshly cleansed discrete area—nose …cheeks … forehead. Don’t let it dry. Instead, wait until it just begins to get tacky—anywhere from 10 seconds to several minutes. Then, using circular motions with the fingertips or a washcloth, rub into the skin for about 30 seconds. The slippery texture seems to guarantee that you can’t rub too hard. You’ll notice tiny flecks emerging, which some claim are beads of dead skin cells. More likely, agrees Dr. Geraghty, they’re acrylate residue. Repeat on other areas of your face. If you seek an even-toned, foundation-free complexion, with diminished-looking pores, this may do it. Try it on your elbows too. Many are tempted to use these gels every day, but the usual advice is two or three times a week. 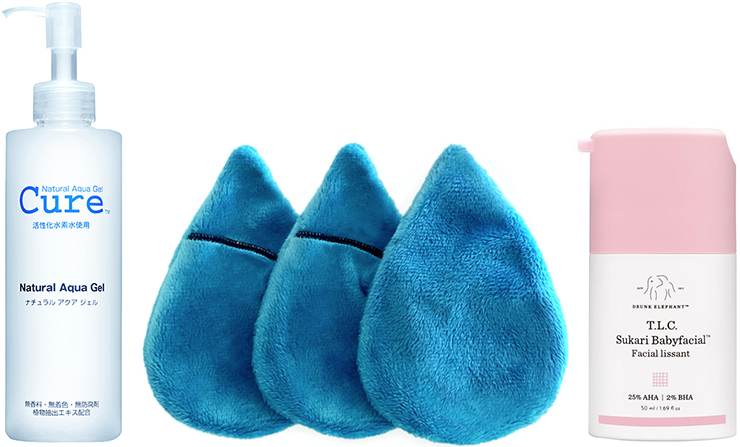 The Makeup Mitty, 3-pack, $38.50 on TakeMyFaceOff.com. For a softer touch than your fingertips, rub off the peeling gel with this plush, deep-pile, quick-drying, patent-pending washcloth alternative, developed by a traveling classical musician. It’s also a terrific makeup remover. The T.L.C. mask is loaded with potent rejuvenator acids: for starters, 25 percent alpha hydroxy acids (glycolic…tartaric…lactic…citric) to soften fine lines and wrinkles, lead to smoother skin, even out mottled pigmentation, and ramp up collagen and elastin,” says Dr. Geraghty. Plus, it’s got 2 percent anti-inflammatory salicylic acid (a relative of aspirin), “effective at removing natural lipids that can contribute to clogged pores.” All in all…a high-powered mix you’d expect would irritate the skin. Instead, it leaves a warm, slightly revved-up sensation. That’s thanks to niacinamide, mixed in to “enhance cell turnover, reduce facial redness and improve skin tone,” adds Dr. Geraghty, who recommends this ingredient for rosacea and sensitive skin. Copper Amino Isolate Serum 2:1 by NIOD.com, $60. Deciem, a four-year old Canadian umbrella cosmetics supplier, bills itself as “The Abnormal Beauty Company” and seems to be breaking all the cosmetics industry rules. Its founder-CEO, a former computer programmer who writes all the promotional materials, comes across as outspoken and blunt. One of its product lines, The Ordinary, offers high-performance potions for under $10 and has a devoted following. Deciem’s popularity hasn’t escaped the attention of the Estée Lauder Companies, which now owns a minority share; its president, Fabricio Freda, cites this upstart’s “unique business model” and “global growth aspirations.” Deciem stores have already opened stores in several countries. In New York City, it has branches in Nolita and Brooklyn, with more planned for later this year. Fermented Soybean Bio Cellulose Mask, $6 at Innisfree.com. Even if you haven’t tried them yet, you’ve probably noticed foil-wrapped sheet masks at drugstore and supermarket checkout counters. They’re everywhere these days, and like a lot of 21st century cosmetic innovations, they originated in Korea—where women reportedly affix one of these moisture-laden innovations (made of a sturdy but permeable, non-woven fabric) to their face every night. What’s special about them? They adhere to the skin, where they’re meant to stay for 20 minutes. And though they’re drenched with serums, they don’t, amazingly, drip. Most women lie down while wearing these masks—but that’s not absolutely necessary. As an experiment, I wore them while sitting up, typing and knitting, and they stayed put. Some sheet masks are for parched skin, some for wrinkles, some for sagging, some for dark spots. Dr. Geraghty “can’t say they’re essential. They’re not backed by any significant scientific evidence.” But, she continues, “doctors know that occlusion—simply trapping any topical ingredient against the skin with something tight or plastic-y—can help to increase that ingredient’s strength and efficacy. So sheet masks do make some inherent scientific sense, and some of them may be found to offer benefits with consistent use.” Once the mask is removed, it may also make sense to leave the residue on the skin overnight, allowing for additional absorption. 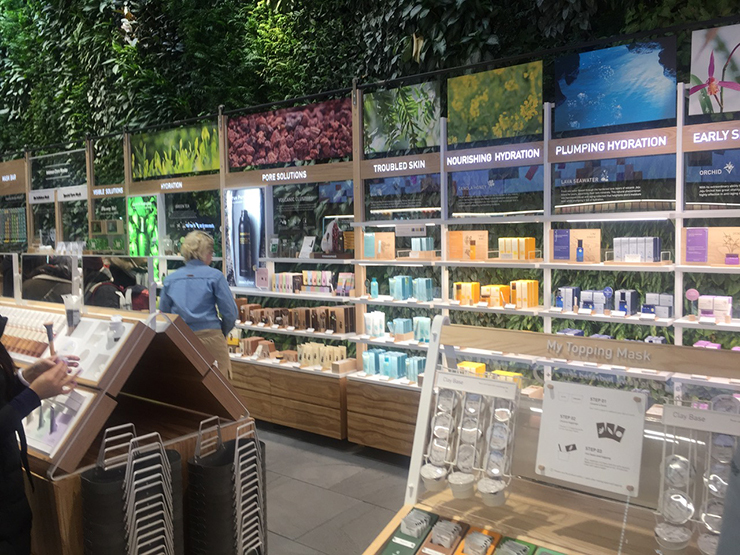 The Innisfree shop in Union Square has a 21 foot living plant wall. Innisfree, a highly touted Korean beauty company, has a wide and customizable range of specialty sheet masks. If you’d like to explore them, they’re available at the recently opened Innisfree Western Hemisphere beachhead, in the Union Square area. For starters, try the Fermented Soybean Bio Cellulose Mask, whose antioxidant-rich soybeans are said to be extra-potent. What’s more, the mask material is a nano-fiber that promises a precise fit to the contours of each face. The Lip Slip, $28 at SaraHapp.com. Are your lips as bedeviled as mine from the cold wind and steam heat? And do you, like me, find that just about every pomade is a mere hour-long fix? Here’s an exception: the Sara Happ Lip Slip, a nice, thick balm with staying power—part of a lip-care-exclusive product line developed by an ESPN journalist-turned-beauty entrepreneur in her Los Angeles kitchen. I now smooth on Lip Slip overnight, every night and over my lipstick by day. And while I find myself reflexively biting my lips, expecting chapping, it’s gone—no doubt due to the beeswax and jojoba and macadamia seed oils contained therein.